This post original appeared on the KiraGrace Blog. 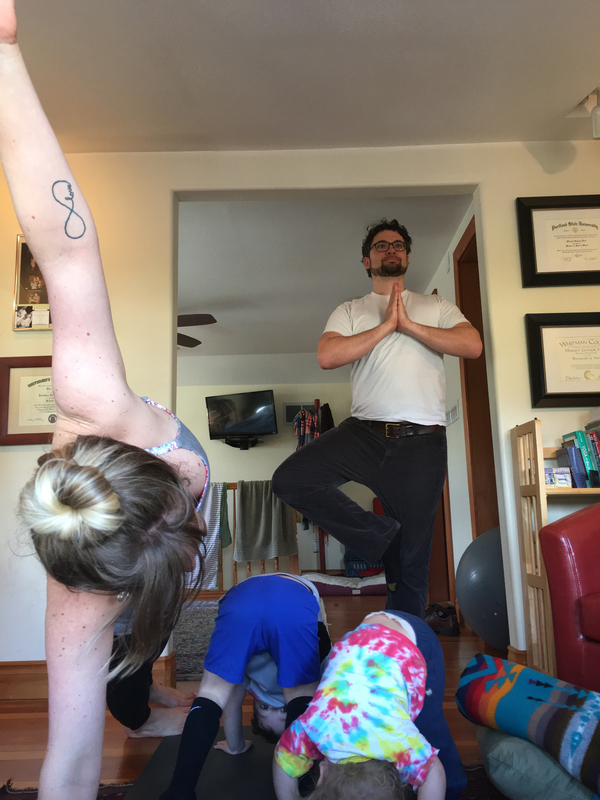 As mother of two young boys, a full time social worker, a prenatal yoga teacher and an instructor of a childbirth preparation class, the Yoga Way to Birth, I am very familiar with the balancing act that comes along with trying to fit it all in. My plate is very full at the moment, and people often wonder how I have time for it all and maintain my sanity. But the truth is I love everything that I have on my plate, and putting something back at this point doesn’t feel like an option. So instead, I use these simple steps to stay grounded and keep my life in balance. My breath is my barometer. When I close my eyes, draw my focus inward, and drop into the awareness of my breath, I suddenly become more conscious of the current forces in my life. Starting where you are right now is always the perfect place to begin. Once I have some idea of where I am, I can then ask myself, “What do you need?” This is not a long process. Usually it only takes a couple minutes to realize what has been missing. Often it is connected to my basic needs, like feeling fatigued or needing to exercise. There are also the times when simply starting to ask myself what I need is enough in itself. This simple act of self care allows me take inventory and see that often what I need I already have. Now that you know where you are and what you really need, you can plant your intention. The root of the word intention comes from the Latin word intendere which means to stretch toward your purpose. Remember stretching can take you out of your comfort zone, but that is usually where our best learning happens. Your intention can be simple – maybe it’s that you have screen free evenings so you can be more present when you are with you kids, or that you want to carve out 10 minutes in the morning to sit in meditation before anyone else in the house is awake. Choose an intention that speaks directly to your heart space and that leaves you feeling filled up and content. This is where the “work” of finding balance comes together. On average, it takes around 28 days for a new practice to become habit or part of your routine. Be patient with your practice, but also be willing to let it go if you find that is not a realistic or attainable. Think about that balancing pose you’ve practiced in a yoga class – sometimes it comes with ease, other times it feels like a struggle to find stability. This is true in life, too. Sometimes no matter how many times you’ve practiced something, it will still be off. This practice isn’t a race, there is no finish line, but the rewards from continued practice lie in deeper knowledge of oneself and in the fact that the days we can’t find balance are necessary, temporary, and often provide valuable moments of learning and growth. This is a phrase used by Katy Bowmanwhen describing how to create a movement based lifestyle. This is not multi-tasking, but it is a way to encourage yourself to combine activities that normally you would separate. For example, I need daily walks during my work day, and I also crave reading and learning new information to keep my social work and yoga practice feeling fresh and inspired. So I listen to podcasts while I walk every day during my break. So, can you let your kids join you on the yoga mat? Could you include some stretching and movement while you’re at your desk at work? Can you find a way to incorporate your family into some of your favorite pastimes? With our incessant culture of busyness, how can you cultivate a sense of spaciousness by meeting multiple needs at the same time? 5. Find your tribe. Last, but perhaps the most important of them all, is finding your people. Heaven knows I could not do what I do all alone. Remember in step #1 when we discovered our needs? Well, sometimes we cannot meet our needs on our own and that is when it is time to ask for help. As a social worker, I am often reminding people that it takes more strength and courage to ask for help that it does to try to muscle through it all. The truth is people want to help you out. We derive a sense of meaning and purpose by being of service to others. So the next time someone offers to watch your kids or bring a meal, say, “Yes!” Accepting help can be freeing. It is also a reminder that we are not in this alone…we are all in this together. Balance is not static state. Balance is a moving target and is dynamic and free flowing. Remember to adjust accordingly. We will get glimpses of feeling like we have it all together and then things will fall apart. That is the nature of her ever-changing dance. 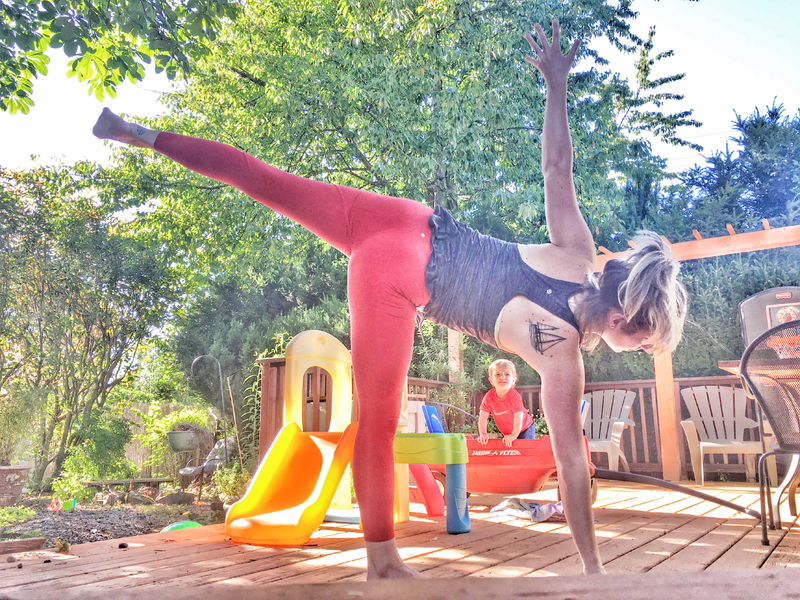 As a yoga mama, or just any human, what is vital in this process is a sense of self-compassion. Be kind to yourself, forgive, learn and grow. Having balance in your life is not an end destination where you arrive and get to stay. Living a balanced life is about being open to the present moment in all her beauty and rawness. This entry was posted in awareness, childbirth, meditation, mental health, mindfulness, motherhood, parenting, parenting is yoga, pregnancy, Women, yoga, yoga therapy and tagged balance, social work, truth, yoga, yoga life, yoga of motherhood, yoga practice. Bookmark the permalink.